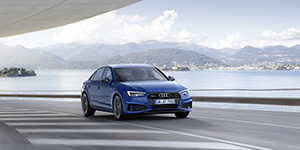 The accomplished and super-refined performance of the Audi A4 will soon be available to experience in even higher definition thanks to a comprehensive package of styling updates to the 2019 Model Year Saloon and Avant ranges that also goes hand-in-hand with a healthy dose of detail equipment enhancements. The design-oriented changes sharpen the look of SE and Sport versions and raise the S line specification profile with an even more purposeful new treatment. Externally, the more purposeful stance adopted by SE and Sport versions comes courtesy of a revised front and rear bumper design, more pronounced side skirts, a special finish for the Singleframe and side air inlet grilles, a roof edge spoiler in Avant versions and a rear diffuser flanked by new look trapezoidal tailpipes. SE versions will retain wheels of the same 17-inch diameter but in a new design while Sport models will upgrade to a new, larger 18-inch wheel. The look of S line and Black Edition models is accentuated at the front by a striking new 3D-look Singleframe. This is edged by wedge-shaped bumpers incorporating sizeable inlets with a U-shaped clip separating their exterior and interior areas, a honeycomb grille and separate openings which guide a portion of the airflow into the wheel housings, where it flows past the wheels. At 19 inches those wheels are now larger and newly designed in the S line specification, contributing to the more muscular profile, and at the rear a new, more contoured S line diffuser separates the new look tailpipes. To round off the exterior updates for these versions a new colour– Turbo Blue – will be available exclusively in conjunction with Black Edition specification. Detail equipment enhancements that will make the A4 even more of a pleasure to live with day-to-day have also been added across the board as part of the update. On top of their already extensive range of equipment SE versions gain MMI navigation (SD card-based), a seven-inch colour Driver’s Information System to replace the original five-inch monochrome version, an upgraded multi-function steering wheel controlling a wider range of functions and auto-folding door mirrors. Additions to the Sport specification include four-way lumbar adjustment for the driver and front passenger seats and auto-folding door mirrors. The latter are also now included for S line and Black Edition models, as is the high beam assist function for automatic toggling between dipped and high headlight beams as required. Pricing for the new 2019 Model Year A4 models will be confirmed closer to their open-for-order date later this summer ahead of first deliveries towards the end of 2018.